At Indepak, we’ve been creating custom thermoformed packaging since 1967. Medical and pharmaceutical packaging is one of our areas of specialization. Here’s a quick look at Indepak and how we can provide you with a total packaging solution. Quality is our focus, and while meeting agreed-upon specifications is important for clients in any industry, when it comes to the medical and pharmaceutical industries, it is crucial that your packaging meet certain standards. We produce low-particulate packaging, intended for non-sterile and downstream sterilization applications. We provide highly detailed record keeping which ensures traceability down to the box level. We also are ISO 9001:2015-certified, which reflects our commitment to quality assurance. Quality is crucial, but there’s no reason why your medical packaging has to break the bank. Because our facility includes multiple lines of high-speed thermoforming equipment, we are able to use a wide range of thermoform plastic materials, something to suit just about any budget. In most cases, we can produce quality packaging that meets your exacting standards yet stays within your set budget. Our design team loves a challenge, so no matter what type of medical packaging you might need, our designers are equal to the task. 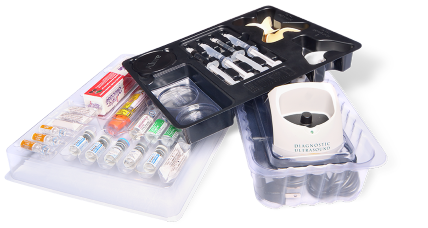 We can produce complex thermoform trays with cavities to hold various instruments and medicines or packaging that surrounds and protects medical devices meant for hospital use or consumer use. When it comes to consumer medical packaging, we will work to create an attractive design that not only protects our product but also shows the product off to its best advantage. These days, everyone is thinking about sustainability and Indepak is no exception. We’ve been re-using, recycling and renewing for years, long before it was popular or required. Virtually every material that we use is recyclable, and for some types of medical packaging, it might be possible to use materials with recycled content. We also can design trap blisters and packaging that incorporates paper and pulp to reduce the overall use of thermoform plastics. Our design team also works hard to reduce packaging waste, creating the smallest possible package design. A smaller package design also allows you to transport more items per shipment, which reduces shipping costs as well as your carbon footprint. If you need packaging fulfillment services, we can provide many options, including heat sealing and RF welding. Our Portland, Oregon facility includes 50,000 square feet of warehouse space, which allows us to store your inventory, and we can even design a custom inventory management system just for you. Additionally, we provide on-time shipping that exceeds 99.5%. With more than 50 years of experience, you can trust Indepak to provide you with the highest quality medical packaging and pharmaceutical packaging. If you would like to discuss a packaging project, give us a call today or fill out our quick contact form and a representative will get in touch as soon as possible. The contact form can be accessed by clicking on the “Contact” tab on our homepage. "Indepak has set a very high standard for themselves, thus it's hard to select 'exceeds' expectations because the standard is so high. We're spoiled and expect it all of the time. I am nearly always very satisfied with results in every area."